After the disappointment of The Dominators comes this delightful story. I have lost track of how many times I have watched The Mind Robber and it is never less than a joy. It's such an unusual story, particularly in view of the Troughton era's reliance on monsters besieging bases of various types. Basically, the Doctor, Jamie, and Zoe find themselves outside time and space following an emergency maneuver. The Doctor is nervous. He insists that Jamie and Zoe don't leave the TARDIS but someone - or something - manipulates Zoe into leaving, followed by Jamie and finally the Doctor. They find themselves hypnotized but the Doctor rescues them, they pile back into the TARDIS. They set off. But then the TARDIS explodes, which has to be one of the great Doctor Who cliffhangers. The rest of the story revolves around a world of fiction into which The Doctor, Jamie, and Zoe have been dropped. There are riddles, traps, and monsters. There is Gulliver (Bernard Horsfall) and the Karkus (Christopher Robbie). There is the Princess Rapunzel (Christine Pirie) and her patience with other people's use of her hair. There are White Robots. And Toy Soldiers. And there's The Master (Emrys Jones). Except not that Master, not THE Master. This Master is an unnamed writer of stories for a Boys Magazine. He churns out 5,000 words a week. He's been kidnapped and used to run the Land of Fiction by a Master Brain. What or who the Master Brain is we never know. We just learn that their plan is to fictionalize all of humanity and leave the Earth empty for conquest. One of the nicest parts of the story is that The Master of the Land of Fiction gets returned home. He isn't destroyed or killed, which might have been the easiest thing because he isn't really a villain. He's being used by the Master Brain. It's the Master Brain that gets fried. I love this story because it is brimful of ideas and odd images from Zoe being trapped inside a jar, to Jamie's changing face. From Gulliver's inability to say nothing but the words Jonathan Swift supplied him with to the creepiness of Jamie and Zoe being pressed within the pages of a giant book and turned into fiction. From the TARDIS console floating in space whilst Jamie and Zoe cling onto it desperately to the Medusa's snake hair rising slowly into the air. It rattles along at a heck of a pace too. 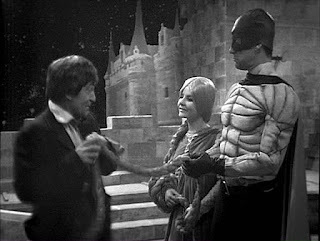 The episodes are generally pretty darn short, which was a consequence (possibly) of Troughton complaining about the amount of work the main cast were forced to do in this story where there aren't many other actors with speaking parts. That still doesn't eliminate all the padding but it makes for a sharper tale, which director David Maloney makes the most of. I don't often talk about directors but there's a coherence to The Mind Robber that is part of its strength. The ideas in it might be weird but the story itself never gets out of control. Troughton's excellent. Again. His confrontation with the Master at the end of the story is fine work. Helped by Emrys Jones giving an equally fine performance. Frazer Hines to is great once again, although he went down with chicken pox and looked likely to miss a couple of episodes. The production team came up with a clever idea, which the 'oddness' of this story could allow, that allowed Jamie to be played by another actor, Hamish Wilson. Wendy Padbury seems to have found her feet, although there's an almighty fluff by her at the end of her fight with the Karkus that is worthy of mention. Padbury seems to be tiny, especially when facing the might of the Karkus. My one quibble with this story is that Zoe is very stupid a couple of times, which doesn't seem to fit her character at all. I'm hoping they aren't going to convert Zoe from astrophysicist to peril monkey just because she's the woman. And there's nothing for me to say here about the sparkly catsuit she wears that hasn't already been said elsewhere. What more do I need to say? The Mind Robber is a fantastic story. There aren't many stories like it in Classic Doctor Who. It's definitely worth a watch if you've not seen it before.